Holiday, Ryan. Trust me, I’m lying : the tactics and confessions of a media manipulator. Portfolio, 2012. In late March, a red billboard appeared on Battleground Avenue in Greensboro, NC. 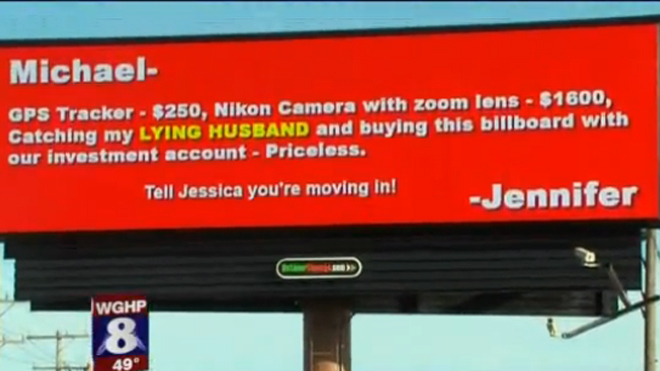 Claiming to be from a scorned woman who caught her husband with another woman, the billboard slowed down traffic on one of Greensboro’s major thoroughfares. The story was picked up and replayed by local and national TV news. Some people immediately suspected that the billboard was actually a marketing trick, perhaps to get the name Nikon (or the unnamed American Express) in front of the public — on TV, radio and newspapers, as well as on blogs, Twitter and Facebook – all for the cost of a small town billboard. Author Ryan Holiday would agree with those who find the billboard suspect. He often uses marketing tricks to sell products. His day job is marketing director for American Apparel, but he also orchestrates deceptions to sell products for other clients. He creates and shapes news for them. In his new book Trust Me, I’m Lying, Holiday explains how marketers use deceptive tactics like fake billboards to manufacture news that draws attention to the products and services that he represents. News is then filtered up, from small blogs to larger sites to national media. Holiday’s book describes what goes on behind the scenes in the worlds of blogging, PR, and online news and he reveals the methods used to manipulate bloggers and reporters. Bloggers in turn sensationalize stories because the headlines that get the most clicks generate the most money. He reveals bloggers who create artificial content, fabricating outrageous stories out of nowhere or distorting a video until it is completely a lie. He gives several examples, including Andrew Breitbart’s news clip about Shirley Sherrod. In the end, Holiday offers no easy solutions. When the incentive is pageviews, bloggers will lie, distort and attack. Holiday hopes that his book will encourage the public to pay for news that is trustworthy. He calls on traditional news agencies to work harder to report the truth and to verify their stories. He also calls for stronger libel and defamation laws. Recommended.